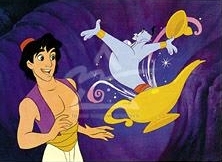 Genie is the English term for the Arabic "jinni | جن". In pre-Islamic Arabian mythology and in Islam, a jinni (also "djinni" or "djini") is a member of the jinn (or "djinn"), a race of spirits. Contrary to popular belief, genie is not an Anglicization of the original Arabic term jinn. It was first used in English as geny to mean a guardian spirit, with the first recorded use in 1655. The word came from the French genie, which in turn came from the original Latin word genius, for a spirit. The extension of meaning to the powerful spirit of Muslim mythology appeared in 1748 by French translators using the French term genie. The definition referring to the powerful mythological spirit has since become dominant. In Western fiction, after the Aladdin tale in the Western version of The Book of One Thousand and One Nights, genies live in small oil lamps and grant three wishes to the person who rubbed the lamp to release the genie while more mischievous ones take advantage of poorly worded wishes. Alternately, they may grant a single wish per day.